Your immune system never sleeps. Every moment of the day, immune cells monitor your body for disease, calling for backup when they detect a threat. It's a system that works elegantly—most of the time. It's not foolproof; if it were, we would never get cancer in the first place. 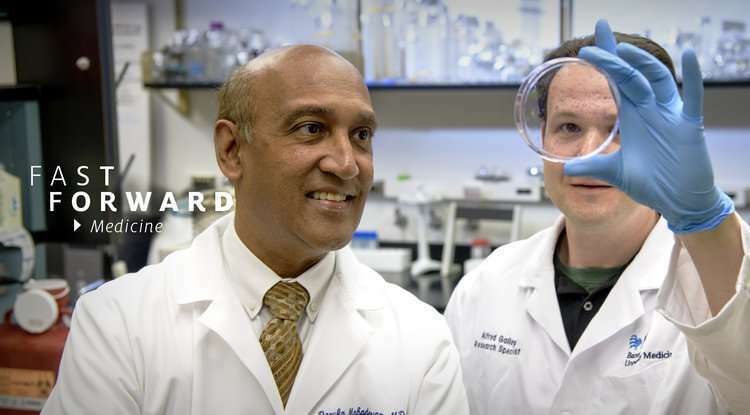 "The immune system is supposed to fight tumors, but it doesn't do it very effectively," says Dr. Daruka Mahadevan, director of the University of Arizona Cancer Center Early Phase Clinical Trials Program. If the immune system is unable to suppress their development early, abnormal cells can blossom into cancers, and cancers can spread throughout bodies, eventually claiming lives. "So many of my patients feel like cancer is a betrayal of their own immune system's ability to survey and protect them," says Dr. Julie Bauman, Cancer Center division chief of hematology and oncology. When tumors evade detection by the immune system, we turn to chemotherapy and radiation. However, these old standbys don't exclusively target cancer cells and are notorious for the collateral damage rained upon healthy cells, often causing side effects such as nausea and hair loss. What if we didn't have to subject normal cells to the friendly fire sprayed haphazardly by chemo and radiation? Many cancer researchers are optimistic about immunotherapy, a treatment that harnesses the power of the immune system, teaching it to recognize—and destroy—cancer cells. "An educated immune cell, like a guided missile, can specifically recognize and destroy the tumor target, sparing normal tissues," says Protul Shrikant, professor of immunobiology at the UA College of Medicine – Tucson. "The development of immunotherapy has revolutionized the way we treat cancer," says Dr. Clara Curiel, leader of the Cancer Center's cutaneous oncology team. "It's a paradigm shift." The idea that the immune system could do the job "really appeals to people," Bauman says. "There's this notion that we're restoring a natural process in the body, the ability to harness its wisdom to attack cancer." The immune system evolved to distinguish between foreign invaders, such as viruses and bacteria, and friendly faces, namely a person's own "self" cells. The ability to recognize this difference is essential to keeping the system in balance. One crucial component of the immune army are T cells, which cruise the bloodstream, on the lookout for "bad guys." T cells can call in reinforcements by special-ordering customized proteins called antibodies, which are able to lock onto these "enemy" cells and mark them for destruction. When T cells see a "non-self" invader, such as a virus, they mount an attack. But when they see a "self" cell, they need to know to leave it alone—otherwise, the immune system would be attacking its own body, a misfire that can lead to autoimmune diseases such as rheumatoid arthritis and lupus. When all goes according to plan, the immune system's foot soldiers patrol the body for enemies while leaving innocent civilians alone. But recognizing a cancer cell isn't as easy as it might seem. "Cancer cells arise from our own cells, so they have a lot in common with our normal cells," Bauman explains. "We have to exploit the things that are different about cancer and teach the immune system to recognize cancer as the enemy. Exploiting that difference is tricky." The idea to harness the immune system in the fight against cancer is not new. In New York, as the 19th century was ending, a doctor named William B. Coley developed a rudimentary predecessor to immunotherapy. 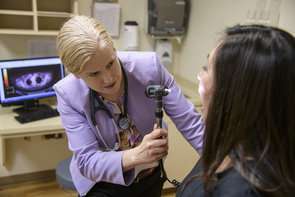 After noticing that some patients with cancers of the bones or soft tissues, called sarcomas, went into remission after coming down with strep infections, he hypothesized that the bacteria that caused strep also killed cancer. Based on this hunch, Coley started injecting strep bacteria into sarcoma patients, some of whom experienced dramatic remissions. Rather than directly killing the cancer, the bacteria probably provoked an immune response that was strong enough to wipe out the cancer along with the infection. "He was hyperactivating the immune system by injecting these bacteria," says Dr. Emmanuel Katsanis, the Cancer Center's division chief of pediatric hematology and oncology. "The activated immune system was trying to fight the infection—and, at the same time, fighting the cancer." In 1899, Coley's treatment was licensed by Parke-Davis and Co. It certainly wasn't a cure-all, and it was eclipsed by radiation treatment in the early decades of the 20th century. Chemotherapy came into use during the post-World War II period, and by 1965 the American Cancer Society had put Coley's bacterial cocktail on a list of "unproven" treatments. But the idea that the immune response to infection could be conscripted in the fight against cancer never completely vanished. "When I first started in oncology," Katsanis recalls, "some of my mentors were saying, 'This patient got a severe infection. Hopefully this has stimulated their immune system and they're not going to relapse.'" These days, instead of pinning our hopes on the ability of viruses and bacteria to incite the immune system into a cancer-fighting state, we can create more precise tools. "We've learned how to turn antibodies that we engineer in the laboratory into proteins that fight cancer," Bauman says. Scientists customize these so-called monoclonal antibodies to lock onto a specific cancer molecule, and physicians deploy these "supersoldiers" into the body. One subtype of monoclonal antibody, called a checkpoint inhibitor, can tinker with a specific component of a T cell, which is akin to a "brake." Shrikant likens the immune process to driving a sports car. "A Ferrari owner needs to appreciate and understand the use of the accelerator and the brake to enjoy the car over the long haul," he explains. "Otherwise, the Ferrari would be wrapped around a tree." While a normally functioning immune system needs those brakes to protect self cells from immune attack, some cancers can slam on the brakes to suppress the immune response. Checkpoint inhibitors cut the brakes—a boon in an environment in which cancer cells, rather than autoimmune diseases, pose the most serious threat. What's more, educating the immune system to recognize cancer cells can lead to long-lasting immune responses well after a patient completes treatment. "When you prime the immune system to recognize a target, it stays as a memory in your immune system," Curiel explains. If, after treatment, a tumor cell starts replicating again, the immune system "will remember that it is a 'foreign' target and will attempt to eliminate it," she says. Cancer Center researchers traverse the "bench-to-bedside" continuum, solving the immune system's riddles to develop new drug candidates. If successful in the lab, these therapies are taken into the clinic to test in patients. "If we want to understand how to fight a disease, we have to do basic research to understand how that disease comes about, or how the body can naturally take care of that disease," says Michael Kuhns, associate professor of immunobiology at the College of Medicine – Tucson. Kuhns' research focuses on the "conversations" between T cells and the rest of the immune system. T cells are able to respond to threats and coordinate attacks. Manipulating these messages can change a T cell's behavior. Kuhns reports that his team already has achieved success in a basic lab setting. "I can redirect T cells to kill targets," he says. "One day, that could have immunotherapeutic applications." Likewise, Shrikant's research focuses on how T cells recognize and destroy cancer cells. "Our laboratory studies span from detailed understanding of fundamental immunology, to validating in animal models, to early phase clinical trials," he says of the ongoing work in his laboratory. Mahadevan specializes in the development of drugs for lymphomas, including peripheral T-cell non-Hodgkin lymphoma, or PTCL, a cancer of the T cells. "PTCL is an aggressive form of lymphoma, and we don't have any good treatments," Mahadevan says. Because immunotherapy harnesses the power of T cells, T-cell lymphoma is an especially challenging target: "The very cells that we are trying to activate are the cells that are abnormal," he says. Mahadevan's lab has identified a combination treatment that is effective against PTCL tumors in lab mice. While the immune system is suppressed in these lymphomas, his team has been able to wake the immune system back up by blocking the ability of cancer cells to divide, significantly improving the survival of these mice. He is now working with pharmaceutical companies and the National Institutes of Health to find a combination that works in patients. Across campus, collaborations between basic scientists and physician-scientists are helping to expand our understanding of how the immune system can be enlisted in the fight against cancer. "There's incredibly good science on campus, and there are a lot of clinics," Shrikant says. "There's tremendous potential." Despite the promise that immunotherapy holds, most patients don't experience the dramatic results that make headlines. "It really depends on the disease and the drug, but I would say that 30 percent of the time, we see some efficacy," estimates Dr. Hani Babiker, associate director of the Cancer Center Early Phase Clinical Trials Program. For her head-and-neck cancer patients, Bauman estimates immunotherapy's efficacy at about 15 percent. "I've seen patients achieve deep remission that we never thought possible," Bauman says. "I wish this worked for everyone, because if 15 percent of people have meaningful responses to immunotherapy, that means 85 percent come to the table with that level of hope and are disappointed." To realize immunotherapy's full potential, it needs to work for more patients. "I don't know whose T cells will be awakened in the right way and attack the cancer, and whose T cells will be awakened in the wrong way and attack the patient," Bauman says. "My hope is that I learn how to unlock the right T cells at the right time for the right cancer." While it's tempting to imagine a future in which immunotherapy alone can vaporize tumors for good, chemotherapy and radiation aren't going away soon, and in fact they can be combined with immunotherapy to increase its effectiveness—leading to longer survival and less disappointment. "I believe we can improve response rates to 70 to 80 percent with these rational combinations," Mahadevan says. "A tumor that is resistant to one immune checkpoint therapy may be really sensitive (to) a combo." Radiation and chemotherapy directly kill tumor cells in a process that can release cellular debris into the body. "Radiation breaks a cancer cell open and exposes all of its hidden 'guts' to the immune system," Bauman explains. "Chemotherapy directly poisons the cancer cell. It dies an immunogenic cell death, and also shows more of its abnormal contents." When immune cells are activated by immunotherapy drugs, this debris can help train the newly empowered immune system to recognize the enemy. "An army of T cells is waiting to recognize some part of that cancer cell as foreign and, therefore, worthy of attack," Bauman says. "Immunotherapy is there to prime that response and help those T cells become more active." Although the idea of immunotherapy is not new, in the clinic it is still in its infancy. The therapy has been responsible for remissions that previously were unimaginable, and patients exhausted by the harsh effects of chemotherapy and radiation may find that immunotherapy is a gentler experience. But most patients fail to respond—while those who do see results also run the risk of potentially serious side effects in which an "over-revved" immune system attacks healthy cells. Also in its infancy is precision medicine, a strategy that helps physicians match patients to drugs based on their genetic profiles. Researchers hope to use such an approach to predict which patients are more likely to respond to particular cancer drugs, including immunotherapy, and who might be at risk for side effects. Undertakings such as the National Institutes of Health's Precision Medicine Initiative, from which the UA Health Sciences and Banner Health have received funding, eventually will help physicians choose optimal treatments based on an individual patient's unique cancer genetics. "We have the ability to sequence the human genome, and we have a multitude of immunotherapy candidates," Bauman says. "When these two things come together, we will have powerful cancer therapy for every person. We can wake up their immune system to the unique antigens within their cancer. That is the holy grail." Energized by the swift advances in the field over the last couple of decades, scientists and physicians look forward to what the future holds. "It's a really exciting time in drug development," Babiker says. "We're discovering a different modality in cancer treatment—using our patients' own immune system to target and fight the cancer." "My hope for the future is that cancer will not be a word we are afraid of," Curiel says. "We have made huge progress in a very short time—it is encouraging." Although there still is much work to do, scientists around the world are devoted to unraveling the secrets of the immune system. UA Cancer Center researchers are involved in laboratory research and clinical trials to plumb the depths of immunobiology, discover new immunotherapy drugs, find more effective treatment combinations and reduce the occurrence of side effects. The hope is that, someday, the wisdom of scientists will join forces with the wisdom of the body to equip our immune cells to lead the charge in vanquishing cancer.